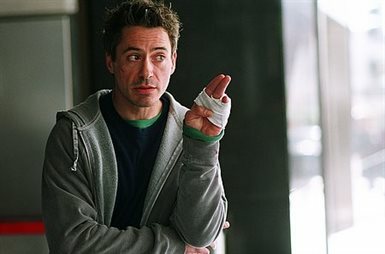 Harry Lockhart (ROBERT DOWNEY JR.) is basically a decent guy. Sure, he's a petty thief who skates through life on a shaky cocktail of dog-eared charm and cockeyed optimism, but he wants to do the right thing. He just doesn't know how, exactly. Harry’s perpetual bad luck takes a turn for the better when he and his partner are doing some after-hours Christmas “shopping” at a New York City toy store and the security alarm breaks up the party. (Yeah, it sounds like trouble, but keep reading.) In making his frantic getaway from the cops, Harry inadvertently stumbles into an audition for a Hollywood detective movie, and faster than you can say Jack Robinson, the producer flies him to Los Angeles for a screen test. Thrust into the cutthroat world of L.A.’s pros, cons, losers and wannabes, Harry is teamed with tough-guy private eye Perry van Shrike (VAL KILMER), AKA “Gay Perry,” to prepare him for his screen test. Gay Perry is ruthless, relentlessly tough and – you guessed it – gay. 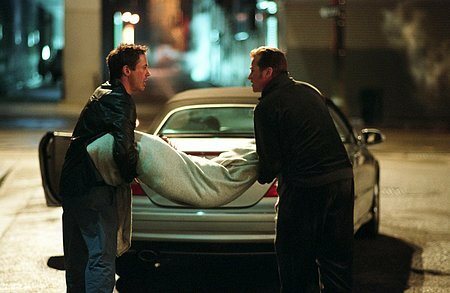 He also has little patience for Harry, who tries out his acting skills by passing himself off as a detective. It seems like nothing short of destiny when the thief-trying-to-be-an-actor-impersonating-a-detective crosses paths with Harmony Faith Lane (MICHELLE MONAGHAN), an aspiring actress who needs his help. Inspired by her hero Jonny Gossamer, a fictitious hard-boiled private eye featured in a series of pulp detective novels, Harmony moved to Hollywood to pursue her dreams...but a few years and a lot of rejections later, she’s facing the harsh reality that her best days may be behind her. When the mysterious suicide of Harmony's sister intersects with a seemingly unrelated case that Harry and Gay Perry are investigating, they suddenly find themselves embroiled in a real-life murder mystery. Bodies surface and re-surface...long-buried family secrets erupt in present-day mayhem...and what began as a free trip to L.A. may result in Harry's one-way ticket to the city morgue. If he's going to stay alive and become the hero that Harmony needs him to be, Harry will have to convince a reluctant Gay Perry to help him solve the case. He'll need to channel Jonny Gossamer's tough-as-nails swagger. And a little dose of luck -- or is it fate? -- wouldn't hurt, either. 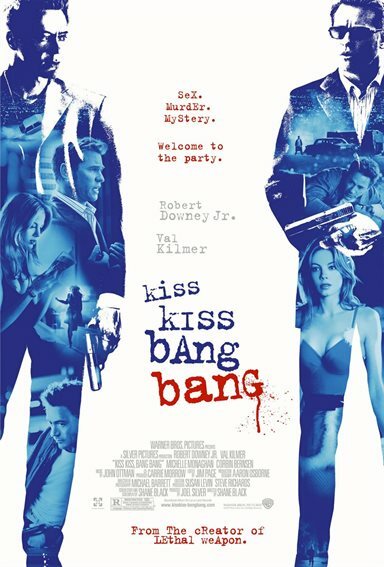 Download Kiss Kiss, Bang Bang in Digital HD from the iTunes store. 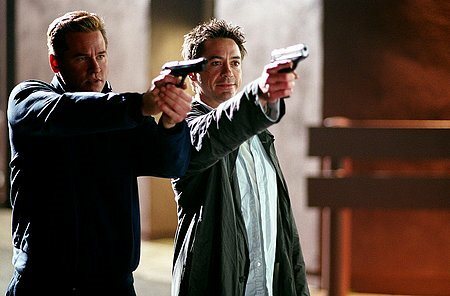 Kiss Kiss, Bang Bang images are © Warner Bros.. All Rights Reserved. 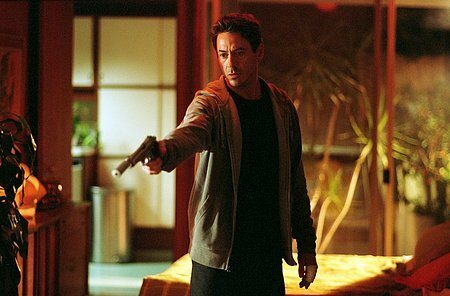 Kiss Kiss, Bang Bang images © Warner Bros.. All Rights Reserved.